Rather than simply a disease caused by elevated plasma lipid levels, atherosclerosis is nowadays also considered to be a chronic inflammatory condition [1Hansson GK. Inflammation, atherosclerosis, and coronary artery disease N Engl J Med 2005; 352: 1685-95.-3Greaves DR, Channon KM. Inflammation and immune responses in atherosclerosis Trends Immunol 2002; 23: 535-41.]. Already at the onset of atherogenesis, monocytes from the circulation migrate into the arterial wall to differentiate into macrophages, start to accumulate cholesterol and produce inflammatory mediators. The subsequent attraction of additional inflammatory cells, migration and proliferation of smooth muscle cells, production of plaque destabilizing factors and necrosis can ultimately lead to acute coronary events, such as myocardial infarction or stroke [4Lusis AJ. Atherosclerosis Nature 2000; 407: 233-41.]. Cannabinoids have been described to have immunomodulatory activities [5Ashton JC. Cannabinoids for the treatment of inflammation Curr Opin Investig Drugs 2007; 8: 373-84.]. Since the cannabinoid receptor 1 (CB1) is predominantly expressed in the central nervous system [6Pertwee R. The evidence for the existence of cannabinoid receptors Gen Pharmacol 1993; 24: 811-24. ], and the cannabinoid receptor 2 (CB2) is highly expressed in immune cells [7Munro S, Thomas KL, Bu-Shaar M. Molecular characterization of a peripheral receptor for cannabinoids Nature 1993; 365: 61-5. 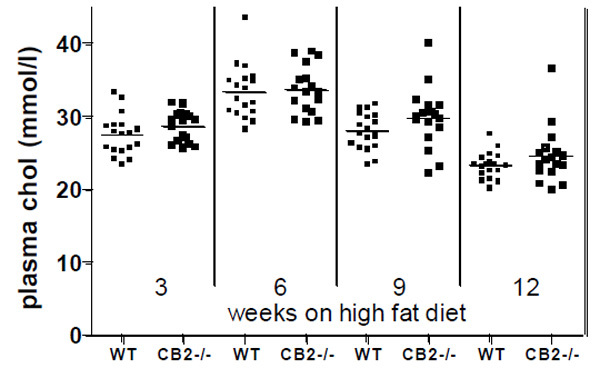 ], the immune regulatory effects of cannabinoids have been mainly ascribed to CB2. It needs to be reminded, however, that expression profiles for CB1 and CB2 are not mutually exclusive. Endogenous cannabinoids or synthetic ligands for cannabinoid receptors have been reported to modulate pro- and anti-inflammatory cytokine production [5Ashton JC. Cannabinoids for the treatment of inflammation Curr Opin Investig Drugs 2007; 8: 373-84. ], inflammatory cell spreading [8Kurihara R, Tohyama Y, Matsusaka S, et al. Effects of peripheral cannabinoid receptor ligands on motility and polarization in neutrophil-like HL60 cells and human neutrophils J Biol Chem 2006; 281: 12908-8. ], migration [9Jorda MA, Verbakel SE, Valk PJ, et al. Hematopoietic cells expressing the peripheral cannabinoid receptor migrate in response to the endocannabinoid 2-arachidonoylglycerol Blood 2002; 99: 2786-93., 10Sacerdote P, Martucci C, Vaccani A, et al. The nonpsychoactive component of marijuana cannabidiol modulates chemotaxis and IL-10 and IL-12 production of murine macrophages both in vivo and in vitro J Neuroimmunol 2005; 159: 97-105.] and B- and T-cell proliferation [11Klein TW. Cannabinoid-based drugs as anti-inflammatory therapeutics Nat Rev Immunol 2005; 5: 400-11.]. Also in more complex models of inflammation, such as oxazolone-induced dermatitis [12Oka S, Wakui J, Gokoh M, Kishimoto S, Sugiura T. Suppression by WIN55212-2, a cannabinoid receptor agonist, of inflammatory reactions in mouse ear: Interference with the actions of an endogenous ligand, 2-arachidonoylglycerol Eur J Pharmacol 2006; 538: 154-62.] and collagen-induced arthritis in the mouse [13Sumariwalla PF, Gallily R, Tchilibon S, Fride E, Mechoulam R, Feldmann M. A novel synthetic, nonpsychoactive cannabinoid acid (HU-320) with antiinflammatory properties in murine collagen-induced arthritis Arthritis Rheum 2004; 50: 985-. ], cannabinoid receptor ligands have been shown to have potent anti-inflammatory effects (reviewed in [5Ashton JC. Cannabinoids for the treatment of inflammation Curr Opin Investig Drugs 2007; 8: 373-84.]). Recently, it was described that the cannabinoid derivative Δ9-tetrahydrocannabinol (THC) is able to reduce atherosclerosis development in apolipoprotein E knockout mice [14Steffens S, Veillard NR, Arnaud C, et al. Low dose oral cannabinoid therapy reduces progression of atherosclerosis in mice Nature 2005; 434: 782-6.]. Subsequent in vitro investigations suggested that THC may exert its effect via inhibition of the TH1 response and reduction of monocyte migration [14Steffens S, Veillard NR, Arnaud C, et al. Low dose oral cannabinoid therapy reduces progression of atherosclerosis in mice Nature 2005; 434: 782-6.]. Since the effects could be counteracted by a CB2 receptor antagonist, SR144528, the authors concluded that the effects of THC were mediated through CB2. It has, however, just now been described that THC also acts at peroxisome proliferator-activated receptor (PPARs), thereby potentially inducing cardioprotective effects [15O'Sullivan SE. Cannabinoids go nuclear: evidence for activation of peroxisome proliferator-activated receptors Br J Pharmacol 2007; 152: 576-82.]. To rule out the possibility that the above mentioned immune modulations might be caused or influenced by off-target activity of cannabinoid compounds, we investigated the effect of CB2 receptor deficiency on atherosclerosis development. The CB2 receptor deficient mouse has been described to show compromised immunomodulation in vitro [16Buckley NE, McCoy KL, Mezey E, et al. Immunomodulation by cannabinoids is absent in mice deficient for the cannabinoid CB(2) receptor Eur J Pharmacol 2000; 396: 141-9.] and in vivo [17Buckley NE. The peripheral cannabinoid receptor knockout mice: an update Br J Pharmacol 2008; 153: 309-18.]. In the present study, a bone marrow transplantation was performed to specifically investigate the effect of haematopoietic CB2 deficiency, and thereby lack of endocannabinoid signaling via CB2, on atherosclerosis development in LDL receptor knockout mice. Female LDL receptor knockout mice (LDLr-/-, n=40) were purchased from the Jackson Laboratory (Bar Harbor, MA, USA) and used as acceptor mice. CB2 receptor knockout mice (CB2-/-) were obtained from Dr. Andreas Zimmer (University of Bonn, Germany) and bred at Schering-Plough, Oss. Both strains of mice had been backcrossed to the C57Bl/6 background for at least 10 generations. Male CB2-/- mice (n=6) and wildtype (WT) controls (n=6) were used as donor mice for the bone marrow transplantation. All animals were kept on a regular chow diet (SDS, Special Diet Services, Witham, UK), until the bone marrow transplantation. The experiments were approved by the Animal Welfare Committee of MSD, Oss. Animals were maintained in filter-top cages and given acidified drinking water (pH=2.0) supplemented with neomycin (100mg/l, Sigma) and polymyxin B sulfate (60.000 U/l, Sigma) from 1 week before transplantation until 4 weeks after. Prior to irradiation, the acceptor mice were anaesthetised by intraperitoneal injection with 100 mg/kg ketamine (Alfasan, The Netherlands) and 10 mg/kg xylazine (Eurovet, The Netherlands) in saline. Subsequently, animals were subjected to 8 Gy of total body irradiation using a 137Cs source (Gammacell 3000 Elan, MDS Nordion, Canada). One day after irradiation, acceptor mice were transplanted with bone marrow cells from either WT or CB2-/- mice by injection of 1 *107 donor cells into the tail vein. Four weeks after transplantation, animals were put on a high fat diet (Arie Blok, Woerden, The Netherlands) containing 16% fat and 0.15% cholesterol. After 12 weeks on the diet, animals were sacrificed and the hearts and aortic arches were isolated for further analysis. Aortic arches and hearts were stored overnight in phosphate-buffered formalin solution (4%) and the hearts were embedded in paraffin. The aortic arches were cut open via the outer curvature and fixed onto a silicone-covered petridish (Austerlitz insect pins 0.025 mm, finescience.com). Subsequently, the tissue was stained with Oil Red O ﴾Sigma-Aldrich, Zwijndrecht, The Netherlands) and plaque size was quantified using a Zeiss Axioplan microscope and IDTCC software. Serial cross sections (4 µm) of the heart throughout the entire aortic valve area were used for histological analysis. Sections were stained with haematoxylin-eosin (HE). Per mouse, 4 sections (with intervals of 40 µm) were used for quantification and qualification of atherosclerotic lesions. For determination of severity of atherosclerosis, the lesions were classified into five categories (type I-V) as described before [18Gijbels MJ, van der CM, van der Laan LJ, et al. Progression and regression of atherosclerosis in APOE3-Leiden transgenic mice: an immunohistochemical study Atherosclerosis 1999; 143: 15-25. ]: I) early fatty streak, II) regular fatty streak, III) mild plaque, IV) moderate plaque, V) severe plaque. In addition to plaque severity, the degree of collagen deposition, necrosis, monocyte adherence, inflammatory infiltrations and large foam cell content was scored by an experienced pathologist (a score of 0-4 was assigned, MG). Lesions were qualified and quantified using a Zeiss Axioplan microscope and IDTCC software. To determine the chimerism in our transplanted mice we took advantage of the fact that the donor bone marrow is LDLrWT, whereas recipient mice are LDLr-/-. Chimerism was determined in 40 µl peripheral blood samples by quantifying the amount of LDLr-/- DNA relative to a control gene (p50). Genomic DNA was isolated using the GFX Genomic DNA Purification Kit (Amersham Pharmacia Biotech. Inc., Arlington Heights, IL, USA).The samples were assayed in duplicate using the TaqMan Universal PCR Master Mix and the ABI Prism 7900 HT Sequence Detection System (Applied Biosystems 2001) using 300 nM primer and 200 nM probe. LDLr-/- specific primer/probe set : forward 5’-GCTGCA-ACTCATCCATATGCA-3’; reverse 5’-GGAGT-TGTTGA-CCTCGACTCTAGAG-3’; probe 5’-6FAM-CCC-CAGTC-TTTGGGCCTGCGA-TAMRA-3’. p50 specific pri-mer-/probe set: forward 5’-AACCTGGGAAT-ACTTCAT-GTGACTAA-3’; reverse 5’-GCACCAG-AAGTCCAGG-ATTATAGC-3’; probe 5’-TET-TCCGTGC-TTCCAGTGT-TTCAAATACCTTTTT-TAMRA-3’. After different periods of diet feeding ﴾3,6,9 and 12 weeks), blood was drawn via tail incision into heparinised glass capillaries ﴾Hirschmann Laborgeräte, Eberstadt, Germany) following a 4-hour period of fasting. Plasma cholesterol was determined using the Cholesterol Liquicolor assay (Instruchemie, The Netherlands) following manufacturers instructions. For leukocyte analysis, heparinised blood samples were washed in erythrocyte lysis buffer (0.155 M NH4Cl, 10 mM NaHCO3). Samples were either stained with Mac1-PE and Gr1-FITC (BD Pharmingen, R&D Systems) for detection of macrophages (Mac1+, Gr1-) and granulocytes (Mac1+, Gr1+); or with B220-PE and CD3-FITC (BD Pharmingen) to detect B-cells (B220+) and T-cells (CD3+). As isotype controls, rIgG2bκ-PE, rIgG2aκ-PE, arHamIg1κ-FITC (BD Pharmingen) and rIgG2bκ-FITC (R&D Systems) were used. Statistical analysis of atherosclerotic plaque size in the aortic arch and root was performed using GraphPad Prism (Version 4.03, GraphPad Software Inc., San Diego, CA, USA). To test whether CB2-/- transplanted mice had larger plaques in the aortic root or arch than WT transplanted animals, a one-sided non-parametric Mann-Whitney rank sum test was performed. To test whether CB2-/- transplanted mice had a higher plaque severity than WT transplanted mice, a one-sided linear-by-linear association test was performed. As opposed to the Chi-square test, this test accounts for the ordinality of plaque severity. The same test was used for the association between transplant type and pathology scores, but since here the direction of the effect is not anticipated, two-sided p-values are reported. These tests were performed using the library 'coin' from the statistical software R (R Development Core Team (2007); http://www.R-project.org). P values less than 0.05 were regarded significant. Bone marrow cells from CB2-/- or WT mice were transplanted into lethally irradiated LDLr-/- mice, to yield chimeric LDLr-/- mice with either CB2-/- or WT blood leukocytes. The body weight of all animals decreased on average by 15% within 5 days after irradiation, returning to pre-irradiation levels within 10 days after the transplantation. There were no differences in body weight between CB2-/- and WT transplanted animals (data not shown). To determine whether the transplantation had an effect on blood leukocyte composition, FACS-analysis was performed on blood samples drawn 5 weeks after transplantation. As shown in Table 1, the percentages of blood granulocytes, monocytes, T-cells and B-cells were not significantly different between CB2-/- and WT transplanted animals. Furthermore, quantitative PCR analysis showed that on average 94% of leukocytes were of donor origin in both groups, indicating a successful engraftment. After 3 weeks of high fat diet feeding, plasma cholesterol levels were 25.8 ± 2.1 mmol/l in the CB2-/- transplanted group and 23.5 ± 2.8 mmol/l in the WT transplanted group. In the course of high fat diet feeding, plasma cholesterol levels slightly increased to about 30 mmol/l, but were never significantly different between CB2-/- and WT transplanted animals (Fig. 1 ). Plasma cholesterol levels of LDLr-/- transplanted with WT bone marrow (n=18) or CB2-/- bone marrow (n=17) measured in time during high fat diet feeding. A) Representative photomicrographs of Oil Red O stained aortic arches derived from a WT transplanted animal (left panel) and a CB2-/- transplanted animal (right panel). Dark red staining indicates an atherosclerotic lesion. B) The atherosclerotic lesion area measured in the aortic arch by quantification of Oil red O staining. Shown is the percentage of the aortic arch covered with an atherosclerotic lesion for each individual animal. Representative photomicrographs of the aortic valve area of a WT transplanted LDLr-/- mouse (panel A) and a CB2-/- transplanted LDLr-/- mouse (panel B) stained with haematoxylin-eosin (magnification 20x). Note that in the CB2-/- transplanted animal all three aortic valves are filled with an atherosclerotic plaque, whereas in the WT transplanted animal one aortic valve is virtually free of atherosclerotic lesions. C) The atherosclerotic lesion area measured in the entire aortic valve area. Shown is the average atherosclerotic lesion size in the aortic root for each individual animal. D) The atherosclerotic lesion area measured per aortic valve. Shown is the average atherosclerotic lesion size per aortic valve for each individual animal. The valves were indicated A, B, and C arbitrarily, however, care was taken that for each animal A, B and C had the same orientation in the heart. A) Lesion severity in the aortic valve area presented as percentage of all plaques (I. early fatty streak, II. regular fatty streak, III. mild plaque, IV. moderate plaque, V. severe plaque). B) Lesion severity of the plaques in valve B as percentage of all plaques in valve B. Representative photomicrographs of an atherosclerotic lesion containing: C) large foam cells or D) inflammatory infiltrates with small macrophages stained with haematoxylin-eosin (magnification 40x). To investigate the role of CB2 in atherosclerotic lesion formation, the lesion area in the aortic arch was determined by en face analysis of oil red O stained tissue (Fig. 2A ). Interestingly, the percentage of the aortic arch covered with an atherosclerotic lesion was significantly higher in CB2-/- transplanted animals (6.40 ± 3.21%) than in WT transplanted animals (3.85 ± 1.62%) (Fig. 2B ), indicating that haematopoietic CB2 deficiency enhanced atherosclerosis development in the aortic arch. To determine whether this also holds true at other locations in the vasculature, the aortic root of all mice was analyzed. Cross-sections of atherosclerotic plaques found in the aortic root of WT and CB2-/- transplanted LDLr-/- mice are shown in (Fig. 3A ). Atherosclerotic lesions were very advanced in both groups, and many contained large numbers of foam cells and inflammatory infiltrates and a necrotic core. Analysis of lesion size in the aortic root showed that haematopoietic deficiency of CB2 had no significant effect on the total atherosclerotic lesion area (Fig. 3B ). The average lesion area was 0.51 ± 0.17 µm2 in the CB2-/- transplanted group and 0.45 ± 0.13 µm2 in the WT transplanted group. We know from experience in this model, that one of the three aortic valves demonstrates delayed atherosclerosis development compared to the other two. Indeed, whereas all three aortic valves in the CB2-/- transplanted animal are filled with large atherosclerotic lesions, in the WT transplanted animal one aortic valve is virtually free of atherosclerotic lesions (Fig. 3A , valve B ). Since different locations in the vasculature differ in their propensity to develop atherosclerotic lesions, due to e.g. location or differences in shear stress [19Cunningham KS, Gotlieb AI. The role of shear stress in the pathogenesis of atherosclerosis Lab Invest 2005; 85: 9-23. ], we analyzed the lesion size for each aortic valve separately. 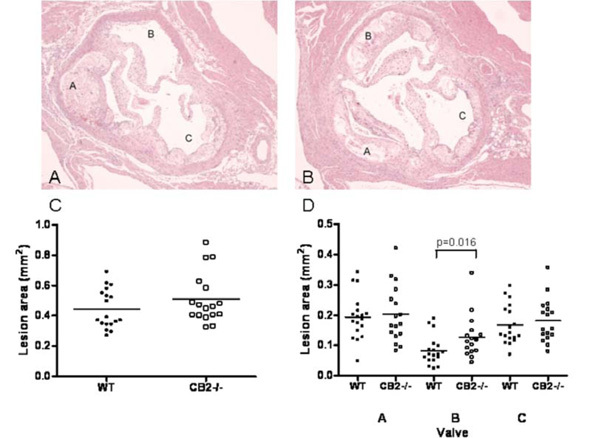 The aortic valve that demonstrated delayed plaque formation was found to contain significantly larger lesions in CB2-/- transplanted animals (0.13 ± 0.07 µm2) as compared to WT transplanted mice (0.08 ± 0.05 µm2, Fig. 3C ). 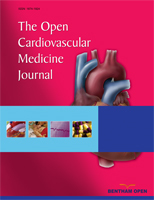 Thus, although 12 weeks of high fat diet feeding caused massive atherosclerosis development in the aortic root of all animals, haematopoietic CB2 deficiency enhances plaque formation in the location in the heart that normally shows slightly delayed atherosclerosis development, thereby corroborating the data obtained from the aortic arch. Atherosclerosis severity was qualified in the aortic valve area of the heart by sorting plaques in the categories [18Gijbels MJ, van der CM, van der Laan LJ, et al. Progression and regression of atherosclerosis in APOE3-Leiden transgenic mice: an immunohistochemical study Atherosclerosis 1999; 143: 15-25. ]: I) early fatty streak, II) regular fatty streak, III) mild plaque, IV) moderate plaque, V) severe plaque. When all plaques were taken into account, no difference was found in the distribution over the lesion categories between CB2-/- and WT transplanted animals (Fig. 4A ). Most of the atherosclerotic lesions are severe plaques and only a limited number of fatty streaks was found in both animal groups, supporting the conclusion that atherogenesis was advanced in both groups. In the aortic valve with delayed atherogenesis, i.e. valve B (Fig. 4B ), the distribution of the plaques over different lesion types was indicative of earlier lesions; the majority of plaques was categorised as fatty streaks and mild plaques. In valve B, CB2-/- transplanted animals showed less fatty streaks and more mild to severe plaques than WT transplanted animals. This difference, however, did not reach statistical significance (p=0.08). In addition to plaque severity, several parameters of plaque composition were profiled for all lesions. There was no difference between CB2-/- and WT transplanted animals with regard to the lesion content of collagen, necrosis and monocyte adherence (data not shown). The amount of inflammatory infiltrates containing small macrophages seemed to be higher in CB2-/- compared to WT transplanted animals (score 2.18 ± 0.88, versus 1.78 ± 1.00, respectively), however, this difference was not significant (p=0.29). On the contrary, the amount of large foam cells was significantly lower in CB2-/- compared to WT transplanted animals (score 2.56 ± 0.70, versus 2.06 ± 0.56, respectively; p=0.04; see Fig. 4C and D for representative photomicrographs of large foam cell areas and inflammatory infiltrates). These data together might suggest that CB2 deficiency enhances plaque severity and the inflammatory phenotype of an atherosclerotic lesion. In the present study, the role of haematopoietic CB2 deficiency on atherosclerosis development in LDLr-/- mice was examined. The results show that CB2 deficiency aggravates atherosclerosis in the early stages, as measured in the aortic root and arch. However, when atherosclerosis is developed to a severe level, lack of CB2 does not further enhance atherosclerosis. Thus, endocannabinoid signalling via CB2 seems to have a protective effect in atherosclerosis development. The current study confirms previously reported data demonstrating that THC, a general cannabinoid receptor agonist, can inhibit development of atherosclerosis in ApoE-/- mice [14Steffens S, Veillard NR, Arnaud C, et al. Low dose oral cannabinoid therapy reduces progression of atherosclerosis in mice Nature 2005; 434: 782-6.]. Using genetic ablation of CB2 we have now demonstrated that at least part of the effects observed using THC is highly likely mediated through CB2. CB2 deficiency resulted in aggravation of early atherosclerosis, not showing an effect on late atherosclerosis, while treatment with THC showed an effect on both early atherosclerosis and existing atherosclerotic lesions [14Steffens S, Veillard NR, Arnaud C, et al. Low dose oral cannabinoid therapy reduces progression of atherosclerosis in mice Nature 2005; 434: 782-6.]. This difference could be explained by the properties of THC, which has been shown to bind to both CB1 and CB2. Since CB1 has been detected on inflammatory cells as well, it is very well possible that THC could exert additional non-CB2 mediated effects on atherogenesis. For example, recent studies showed that a cannabinoid receptor agonist (WIN55, 212) enhanced the accumulation of cholesterol in macrophages via the CB1 receptor [20Jiang JLS, Pu J, Han ZH, Hu LH, He B. Role of activated endocannabinoid system in regulation of cellular cholesterol metabolism in macrophages Cardiovasc Res 2009; 81: 805-13.]. Additionally, THC has been described to function as a ligand of the nuclear receptor peroxisome proliferator-activated receptor gamma (PPARγ), via which it could cause vasorelaxation and exert cardioprotective effects [15O'Sullivan SE. Cannabinoids go nuclear: evidence for activation of peroxisome proliferator-activated receptors Br J Pharmacol 2007; 152: 576-82.]. However, in vitro, some of the anti-atherosclerotic effects of THC can be blocked by a selective CB2 antagonist [14Steffens S, Veillard NR, Arnaud C, et al. Low dose oral cannabinoid therapy reduces progression of atherosclerosis in mice Nature 2005; 434: 782-6. ], suggesting that THC would exert its effect mainly via CB2. Alternatively, the difference between our study and the work of Steffens and coworkers could be explained by the two different mouse models that were used. It has been described that atherosclerotic lesion development in the aortic root is faster in LDLr-/- mice as compared to the ApoE-/- mice used by Steffens et al. [14Steffens S, Veillard NR, Arnaud C, et al. Low dose oral cannabinoid therapy reduces progression of atherosclerosis in mice Nature 2005; 434: 782-6. ], causing the atherosclerosis in the aortic arch to be more advanced in the current study. Different mechanisms of action may underlie the effect of haematopoietic CB2 deficiency in development of atherosclerosis. Our studies show that the effect is not due to elevated plasma cholesterol levels or changed white blood cell compositions, since there were no differences found in these parameters for the WT and CB2-/- transplanted animals. With respect to plaque composition parameters, our study showed a slightly enhanced amount of inflammatory infiltrates and a significantly reduced amount of foam cells in the CB2-/- transplanted animals. It has been reported that CB1 agonism can enhance macrophage cholesterol accumulation [20Jiang JLS, Pu J, Han ZH, Hu LH, He B. Role of activated endocannabinoid system in regulation of cellular cholesterol metabolism in macrophages Cardiovasc Res 2009; 81: 805-13.]. Whether CB2 antagonism or deficiency blocks cholesterol uptake and thereby reduces foam cell formation remains to be investigated. To our opinion, it is most likely that aggravation of early atherosclerosis in CB2-/- transplanted mice is induced by increased monocyte migration into the vessel wall or reduced macrophage apoptosis propensity. One of the hallmark processes in early atherosclerosis is the migration of monocytes from the circulation into the vascular wall, after which differentiation into a macrophage enables the cell to start accumulating lipids. A number of studies have shown that cannabinoids can influence monocyte or macrophage migration. The endocannabinoid 2-arachidonoylglycerol (2-AG) has been found to act as a chemoattractant for monocytes [21Kishimoto S, Gokoh M, Oka S, et al. 2-arachidonoylglycerol induces the migration of HL-60 cells differentiated into macrophage-like cells and human peripheral blood monocytes through the cannabinoid CB2 receptor-dependent mechanism J Biol Chem 2003; 278: 24469-75. ], whereas synthetic ligands for the cannabinoid receptor generally do not possess chemoattractant properties. These synthetic cannabinoids, however, are often described to be able to inhibit monocyte migration induced by either endocannabinoids or chemokines [10Sacerdote P, Martucci C, Vaccani A, et al. The nonpsychoactive component of marijuana cannabidiol modulates chemotaxis and IL-10 and IL-12 production of murine macrophages both in vivo and in vitro J Neuroimmunol 2005; 159: 97-105., 14Steffens S, Veillard NR, Arnaud C, et al. Low dose oral cannabinoid therapy reduces progression of atherosclerosis in mice Nature 2005; 434: 782-6., 21Kishimoto S, Gokoh M, Oka S, et al. 2-arachidonoylglycerol induces the migration of HL-60 cells differentiated into macrophage-like cells and human peripheral blood monocytes through the cannabinoid CB2 receptor-dependent mechanism J Biol Chem 2003; 278: 24469-75.]. The fact that also CB2 inverse agonists have been described to reduce monocyte migration [9Jorda MA, Verbakel SE, Valk PJ, et al. Hematopoietic cells expressing the peripheral cannabinoid receptor migrate in response to the endocannabinoid 2-arachidonoylglycerol Blood 2002; 99: 2786-93., 22Lunn CA, Fine JS, Rojas-Triana A, et al. A novel cannabinoid peripheral cannabinoid receptor-selective inverse agonist blocks leukocyte recruitment in vivo J Pharmacol Exp Ther 2006; 316: 780-8. ], suggests that the mere removal of a cannabinoid gradient is enough to [10Sacerdote P, Martucci C, Vaccani A, et al. The nonpsychoactive component of marijuana cannabidiol modulates chemotaxis and IL-10 and IL-12 production of murine macrophages both in vivo and in vitro J Neuroimmunol 2005; 159: 97-105., 14Steffens S, Veillard NR, Arnaud C, et al. Low dose oral cannabinoid therapy reduces progression of atherosclerosis in mice Nature 2005; 434: 782-6., 21Kishimoto S, Gokoh M, Oka S, et al. 2-arachidonoylglycerol induces the migration of HL-60 cells differentiated into macrophage-like cells and human peripheral blood monocytes through the cannabinoid CB2 receptor-dependent mechanism J Biol Chem 2003; 278: 24469-75.] influence migration [23Miller AM, Stella N. CB2 receptor-mediated migration of immune cells: it can go either way Br J Pharmacol 2008; 153: 299-308.]. The migration modulatory effects of cannabinoids have been ascribed to the CB2 receptor mainly by the finding that the selective CB2 antagonist SR144528 can inhibit the effects. To rule out the possibility that conclusions are drawn on the basis of aspecific effects of cannabinoid compounds, our investigation using CB2 knockout mice was warranted. Very recently, it was discovered that CB2 expression on the macrophage enhances the propensity to go into apoptosis upon treatment with oxidised low density lipoproteins (OxLDL). CB2 deficient macrophages were found to be resistant to OxLDL-induced apoptosis [24Freeman-Anderson NE, Pickle TG, Netherland CD, Bales A, Buckley NE, Thewke DP. Cannabinoid (CB2) receptor deficiency reduces the susceptibility of macrophages to oxidized LDL/oxysterol-induced apoptosis J Lipid Res 2008; 49: 2338-46.]. The consequences of macrophage apoptosis in an atherosclerotic lesion are multiple: there is strong evidence that macrophage apoptosis reduces early lesion formation, but can aggravate atherosclerosis in advanced lesions [25Kockx MM, Herman AG. Apoptosis in atherosclerosis: beneficial or detrimental? Cardiovasc Res 2000; 45: 736-46.]. Another key inflammatory process in which a function for the CB2 receptor has been documented, is the secretion of cytokines. For many of these cytokines, a proatherogenic (e.g. TNFα) or antiatherogenic (e.g. IL-10) role has been reported (reviewed in [26Tedgui A, Mallat Z. Cytokines in atherosclerosis: pathogenic and regulatory pathways Physiol Rev 2006; 86: 515-81.]). The balance in proinflammatory (e.g. IFNγ, TNFα, IL-6) and anti-inflammatory (e.g. IL-10) cytokines has been suggested to be shifted to the anti-inflammatory side by cannabinoids [27Smith SR, Terminelli C, Denhardt G. Effects of cannabinoid receptor agonist and antagonist ligands on production of inflammatory cytokines and anti-inflammatory interleukin-10 in endotoxemic mice J Pharmacol Exp Ther 2000; 293: 136-50. ], however, the opposite effect has also been reported [27Smith SR, Terminelli C, Denhardt G. Effects of cannabinoid receptor agonist and antagonist ligands on production of inflammatory cytokines and anti-inflammatory interleukin-10 in endotoxemic mice J Pharmacol Exp Ther 2000; 293: 136-50., 28Derocq JM, Jbilo O, Bouaboula M, Ségui M, Clère C, Casellas P. Genomic and functional changes induced by the activation of the peripheral cannabinoid receptor CB2 in the promyelocytic cells HL-60. Possible involvement of the CB2 receptor in cell differentiation J Biol Chem 2000; 275: 15621-8.]. So in vivo, cannabinoids might suppress or increase production of pro-inflammatory cytokines [11Klein TW. Cannabinoid-based drugs as anti-inflammatory therapeutics Nat Rev Immunol 2005; 5: 400-11. ], making it difficult to speculate on the effects of cytokine modulation by CB2 deficiency in atherosclerosis. Taken together, this is the first study investigating the role of the CB2 receptor in atherosclerosis, using the CB2 deficient mouse. The authors Mach and Steffens already posed a hypothesis that endocannabinoid signalling could affect atherogenesis [29Mach F, Steffens S. The role of the endocannabinoid system in atherosclerosis J Neuroendocrinol 2008; 20(Suppl 1): 53-7.]. The current study shows that a lack of endocannabinoid signalling via the CB2 receptor in haematopoietic cells enhances early atherogenesis in LDL receptor deficient mice. These data suggest that enhancement of CB2 signalling, either by raising endocannabinoid levels or treatment with a selective CB2 agonists, can form a novel treatment of atherosclerosis. The authors would like to greatly acknowledge statistical analyses on plaque severity and pathology data by Dr. Mark van de Wiel (Dept. of Epidemiology & Biostatistics, VU University medical center, Amsterdam, The Netherlands). Hansson GK. Inflammation, atherosclerosis, and coronary artery disease N Engl J Med 2005; 352: 1685-95. Greaves DR, Channon KM. Inflammation and immune responses in atherosclerosis Trends Immunol 2002; 23: 535-41. Lusis AJ. Atherosclerosis Nature 2000; 407: 233-41. Ashton JC. Cannabinoids for the treatment of inflammation Curr Opin Investig Drugs 2007; 8: 373-84. Pertwee R. The evidence for the existence of cannabinoid receptors Gen Pharmacol 1993; 24: 811-24. Munro S, Thomas KL, Bu-Shaar M. Molecular characterization of a peripheral receptor for cannabinoids Nature 1993; 365: 61-5. Kurihara R, Tohyama Y, Matsusaka S, et al. Effects of peripheral cannabinoid receptor ligands on motility and polarization in neutrophil-like HL60 cells and human neutrophils J Biol Chem 2006; 281: 12908-8. Jorda MA, Verbakel SE, Valk PJ, et al. Hematopoietic cells expressing the peripheral cannabinoid receptor migrate in response to the endocannabinoid 2-arachidonoylglycerol Blood 2002; 99: 2786-93. Sacerdote P, Martucci C, Vaccani A, et al. 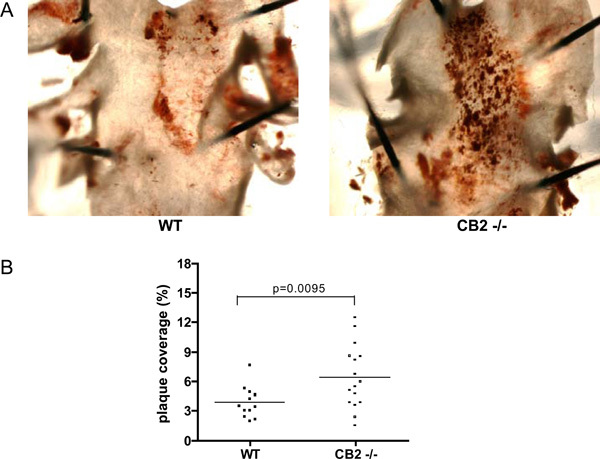 The nonpsychoactive component of marijuana cannabidiol modulates chemotaxis and IL-10 and IL-12 production of murine macrophages both in vivo and in vitro J Neuroimmunol 2005; 159: 97-105. Klein TW. Cannabinoid-based drugs as anti-inflammatory therapeutics Nat Rev Immunol 2005; 5: 400-11. Oka S, Wakui J, Gokoh M, Kishimoto S, Sugiura T. Suppression by WIN55212-2, a cannabinoid receptor agonist, of inflammatory reactions in mouse ear: Interference with the actions of an endogenous ligand, 2-arachidonoylglycerol Eur J Pharmacol 2006; 538: 154-62. Sumariwalla PF, Gallily R, Tchilibon S, Fride E, Mechoulam R, Feldmann M. A novel synthetic, nonpsychoactive cannabinoid acid (HU-320) with antiinflammatory properties in murine collagen-induced arthritis Arthritis Rheum 2004; 50: 985-. Steffens S, Veillard NR, Arnaud C, et al. Low dose oral cannabinoid therapy reduces progression of atherosclerosis in mice Nature 2005; 434: 782-6. O'Sullivan SE. Cannabinoids go nuclear: evidence for activation of peroxisome proliferator-activated receptors Br J Pharmacol 2007; 152: 576-82. Buckley NE, McCoy KL, Mezey E, et al. Immunomodulation by cannabinoids is absent in mice deficient for the cannabinoid CB(2) receptor Eur J Pharmacol 2000; 396: 141-9. Buckley NE. The peripheral cannabinoid receptor knockout mice: an update Br J Pharmacol 2008; 153: 309-18. Gijbels MJ, van der CM, van der Laan LJ, et al. Progression and regression of atherosclerosis in APOE3-Leiden transgenic mice: an immunohistochemical study Atherosclerosis 1999; 143: 15-25. Cunningham KS, Gotlieb AI. The role of shear stress in the pathogenesis of atherosclerosis Lab Invest 2005; 85: 9-23. Jiang JLS, Pu J, Han ZH, Hu LH, He B. Role of activated endocannabinoid system in regulation of cellular cholesterol metabolism in macrophages Cardiovasc Res 2009; 81: 805-13. Kishimoto S, Gokoh M, Oka S, et al. 2-arachidonoylglycerol induces the migration of HL-60 cells differentiated into macrophage-like cells and human peripheral blood monocytes through the cannabinoid CB2 receptor-dependent mechanism J Biol Chem 2003; 278: 24469-75. Lunn CA, Fine JS, Rojas-Triana A, et al. A novel cannabinoid peripheral cannabinoid receptor-selective inverse agonist blocks leukocyte recruitment in vivo J Pharmacol Exp Ther 2006; 316: 780-8. Miller AM, Stella N. CB2 receptor-mediated migration of immune cells: it can go either way Br J Pharmacol 2008; 153: 299-308. Freeman-Anderson NE, Pickle TG, Netherland CD, Bales A, Buckley NE, Thewke DP. Cannabinoid (CB2) receptor deficiency reduces the susceptibility of macrophages to oxidized LDL/oxysterol-induced apoptosis J Lipid Res 2008; 49: 2338-46. Kockx MM, Herman AG. Apoptosis in atherosclerosis: beneficial or detrimental? Cardiovasc Res 2000; 45: 736-46. Tedgui A, Mallat Z. Cytokines in atherosclerosis: pathogenic and regulatory pathways Physiol Rev 2006; 86: 515-81. Smith SR, Terminelli C, Denhardt G. Effects of cannabinoid receptor agonist and antagonist ligands on production of inflammatory cytokines and anti-inflammatory interleukin-10 in endotoxemic mice J Pharmacol Exp Ther 2000; 293: 136-50. Derocq JM, Jbilo O, Bouaboula M, Ségui M, Clère C, Casellas P. Genomic and functional changes induced by the activation of the peripheral cannabinoid receptor CB2 in the promyelocytic cells HL-60. Possible involvement of the CB2 receptor in cell differentiation J Biol Chem 2000; 275: 15621-8. Mach F, Steffens S. The role of the endocannabinoid system in atherosclerosis J Neuroendocrinol 2008; 20(Suppl 1): 53-7.